Musings on the Planet | Musings on the condition of our planet Earth, its place in the cosmos, and the thoughts and state of mind of its inhabitants. Driving around a corner, you go through a tunnel. Coming out, it is all you can do to stay focused on the road. In front of you is one of the most awe inspiring views on the planet: Yosemite Valley. Dominating the left side of the valley is El Capitan. Its vast bulk with sheer cliffs stretch a half-mile above the valley floor. Standing and looking up, the top is just as remote as the moon. And yet, at any time, there are dozens of climbers on half a hundred different routes. The film Free Solo follows Alex Honnold as he prepares to make the first ascent of El Capitan without any sort of aid, either tools or human, other than his shoes and a bag of chalk. Spoiler alert, he successfully makes the climb, which does little to lessen the tension one feels while watching him work his way up the cliff. The slightest error would have meant certain death. While I am not a climber, I have watched them from the safety of the valley floor, and am in awe of the immensity of the sheer wall rising so far above. Images barely convey the physical magnitude of El Capitan, or the challenge it presents. After seeing Free Solo, I compared it to another recent film that portrayed another first. First Man followed Neil Armstrong through the years leading up to the Apollo 11 landing on the Moon, when he, along with Buzz Aldrin stepped out of their vehicle to explore the lunar surface. In some ways I find Alex Honnold’s feat more amazing than that of the crew of Apollo 11. The lunar landing required the efforts of a great many people, and any of the astronauts could have been the first person to step on to the Moon. Neil Armstrong certainly had a set of skills and a temperament well suited to allow him to take the lead for the mission, but it wasn’t really an individual accomplishment. Climbing El Capitan solo without ropes, or any hardware truly was an individual accomplishment, and succeeded due to Alex Honnold’s preparation and his mental and physical attributes. So, I am conflicted in deciding which was the greater feat. Both the Moon and El Capitan require you to raise your eyes above the horizon, to turn your gaze upwards. To most people, both are equally remote and unattainable, and we watch with amazement as more adventuresome humans dangle from ropes with little to connect them to the rock wall, or blast off from Earth at the top of a rocket on their way into space. Both are inherently dangerous feats, and both defy gravity in their own unique ways. From December 2018 through July 2019, the world is celebrating the 50th anniversary of the first missions where humans orbited, then landed, on the Moon. A total of nine Apollo missions went to the Moon and returned safely to Earth. Two of those remained in orbit, six landed, and one other negotiated a return trajectory with a badly damaged spacecraft. We humans love stories. The best are the ones where we identify with the characters or events, or detail heroic deeds. As a culture, we recognize past events and the characters who played important roles in them. From an educational perspective, these events and stories serve to inspire young learners to aspire to something beyond the ordinary. This year and next, enthusiasts and educators will honor two such events in the history of space exploration: the fiftieth anniversaries of the first time humans traveled to the Moon, and then set foot on its surface. The recently released film First Man chronicles the history of lunar exploration, seen through the eyes of Neil Armstrong, the first human to personally experience what Buzz Aldrin called a “magnificent desolation.” In some ways the film also reminds us humans have not returned to the Moon since 1972. While the later landings, and much of the Space Shuttle and International Space Station programs have maintained a human presence in space, in some ways they have become ordinary, falling short of the inspiration we found in the flights of Apollos 8 and 11. Much of our progress in science education has taken place with inspiration from, and in response to the heroic deeds undertaken in pushing the boundaries of human knowledge and capabilities. A few years ago, the theme for the annual International Observe the Moon Night was “What does the Moon mean to me?” Expressing meaning can take a lot of forms, most of them in the form of stories. Humans have long told stories about the Moon and what it means to them, and their culture. As we learn more about the Moon, it turns out the story incorporates much more than the personal or anthropomorphic aspects we impose on this object in the sky. The story is one of exploration and science, as the Moon has its own story to tell about its creation and relationship to the solar system and beyond. From this perspective, exploration is really just learning the story a place has to tell. And at this point in history we are starting to learn the language the story is in, and discovering how to ask the right questions. The story of the Moon emerging from modern science and the explorers, human and robotic, which have landed and/or orbited the Moon is every bit as exciting and fantastic as those our ancestor told sitting around their fires. In late December 1968, Apollo 8, with a crew of three, orbited the Moon ten times and returned safely to Earth. This success was followed with the landing of Apollo 11 on July 20, 1969. Both of these events have entered into modern lore, with people remembering where they were when they watched the view of Earth from the Moon during TV broadcasts from Apollo 8, and the grainy images of Neil Armstrong’s first steps on to Moon. Today there are fewer people who were alive to see those events, than were born after. The days of human exploration of the Moon are now, for most of us, no longer a part of our personal stories. When I was young, my father brought home from work a poster of a photograph with the caption “Historic First Photo of Earth from Deep Space.” This image taken by the Lunar Orbiter 1 reversed the perspective we normally enjoy, showing a crescent Earth suspended above a lunar landscape. While significant, this initial look at the Earth from space did not enter the collective human consciousness with the same depth as a similar image the astronauts aboard Apollo 8 took a little over two years later. The Moon has meant many things to, and inspired many people throughout history. The Moon’s meaning to societies has evolved as technology and our ability to explore have become more sophisticated. However the meaning of the Moon to us as individuals has remained fairly constant. For most of us the Moon is a place of wonder, an anchor and participant in the stories we tell and in our dreams. The Moon is our first introduction to the wonders beyond Earth, and has the potential to serve as the first step towards the universe. At some point in the hopefully not too distant future, humans will again walk and work on the surface of the Moon. Turning their gaze upwards, they will see the shining Earth in the black lunar sky, and ponder. As it turns out, the question that really matters is what does the Earth mean to me? This is an updated version of a post originally appearing in this blog in September 2014. A version also appears as the Education Matters column in the fall 2018 edition of Mercury magazine, a publication of the Astronomical Society of the Pacific. It is a testament to how people tend to hear what they want to hear. The first time was in August 2003 as people were preparing to observe the closest Mars opposition in approximately 60,000 years. A fairly innocuous statement that viewed through a telescope, Mars would look as large as the full moon with the unaided eye, turned into a widespread anticipation of how looking up, people would see Mars glowing red as large as the full Moon in the sky. And, with the idea there was this one and only opportunity to view this wondrous event. This so-called “Mars Hoax” makes a regular August reappearance for every Mars opposition, even if the opposition is taking place at a different time of year. Nikon Coolpix image through a telescope during the 2003 Mars opposition. Oppositions of Mars take place approximately every two years, due to it having an orbital period around the Sun of about two Earth years. During most opposition years, Mars presents a brighter, and larger aspect for viewers. Less often, opposition coincides with Martian perihelion, bringing it much closer, owing to the greater eccentricity of its elliptical orbit about the Sun. 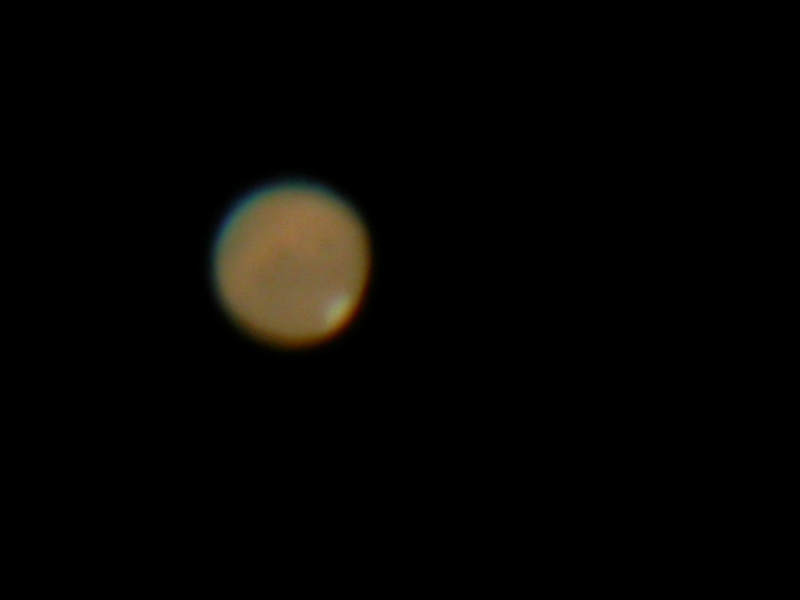 During these oppositions, such as in 2003, Mars truly does provide for a magnificent sight in the sky. Angular separation and angular diameter are important measurements in astronomy in defining the position and apparent size of celestial objects. Backyard astronomers, and learners without sophisticated equipment, can make approximate measures of either using their hands as measuring tools. An open hand with outstretched pinkie finger and thumb describes about a 20° arc; a closed fist 10°; and an extended pinkie about 1°. When applied to the full Moon, it is discovered it has an approximate angular diameter of half a pinkie, or half a degree. 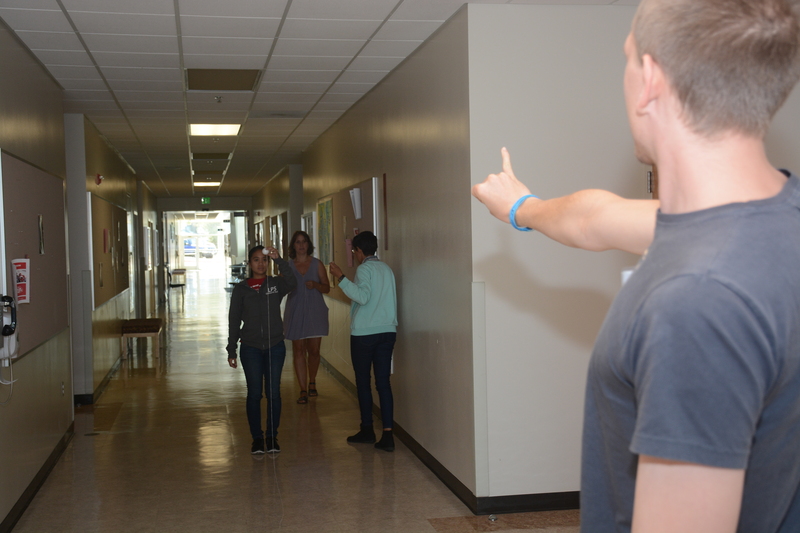 Solar system scaling activities are a staple of most any astronomy professional development for educators. While there are many variations, the most basic has to do with the Earth-Moon system. With a diameter ratio between the two bodies of approximately 4:1, it is easy to model the system with four-inch, and one-inch polystyrene balls. Approximating the Earth-Moon distance as 240,000 miles, and an Earth circumference of 24,000 miles, it is easy to wrap some twine around the Earth ball ten times to find the distance to the model Moon. Due to the principal of similar triangles, the model Moon, when viewed from the position of the model Earth, will present an angular diameter of half-a-degree, or half a pinkie! A good test of the relative accuracy of a learner’s model of the system. Once a learner creates their scale model of the Earth-Moon system, it is an easy extension to include Mars and investigate where to place the model planet so it presents the same angular diameter as the Moon. With a diameter approximately half that of Earth, a two-inch polystyrene ball can represent the Red Planet. Learners can then place the model Mars in a position where it visually appears to have the same diameter as the model Moon, discovering it is twice as far away from Earth as the Moon: about 500,000 miles! Much closer than the closest approach on July 31, 2018 when Mars comes to within 35.8 million miles. Asking the learner to find the actual position of their model Mars relative to the Earth, they discover they need to place it between a quarter and a third of a mile away at about 1,566 feet from their model Earth! They can then attempt to measure their model Mars’ angular diameter, a good task for a Galileoscope, based on knowing the angular field of view of its eyepiece. Viewing the phenomenon of a close Mars opposition can provide a magnificent opportunity for learners new to astronomy to participate in science practices, engaging in evidence-based reasoning and modeling. Applied in a manner where learners discover for themselves the size-distance relationships, the experience may provide a powerful deterrent for the next iteration of the Mars hoax. A version of this post first appeared in the Summer 2018 edition of Mercury Magazine, a publication of the Astronomical Society of the Pacific. At approximately 8:30am on Sunday, May 18, 1980, I unexpectedly woke from a sound sleep. At the time it seemed odd I woke at that particular time. As the morning progressed, it was evident many others around western Washington state noted the sound of a large explosion at the same time. While I have no memory of any sounds, it is almost certain my waking was in response to the eruption of Mt. St. Helens, about 100 miles to the south. For the rest of the day, I watched the news, with updates on the massive eruption. My parents, in East Wenatchee, Washington, were on the edge of the resulting ash cloud, as well as for subsequent eruptions. It wasn’t until the summer of 1982 when I got my first good look at the mountain. Working as a field assistant for Paul Hammond, a Portland State University geology professor, we were mapping lava flows in the Indian Heaven area between Mt. Adams and Mt. St. Helens. The area was newly removed from the red zone around Mt. St. Helens, and the USGS, who was supporting our work, were interested in investigating the history of volcanic eruptions in the region in greater detail. Out of the crater came a constant plume of steam and ash, with periodic larger pulses. In 1987, the US Forest Service reopened the mountain for climbing. A group of us took advantage, and ascended the truncated peak on July 25, 1987. While not a technically difficult climb, the route follows the Monitor Ridge lava flow, then on to the ash and pumice covered upper slopes. A second climb, on July 8, 1988, provided a contrasting experience. More snow in 1988 made for an easier climb, as did a smaller group more interested in looking at the geology of the mountain, rather than the novelty of the experience. The second group included my undergraduate geology professor, Edwin Olson, and fellow geologist Gary Paukert, along with Barb Paukert, and Peter, a friend of Ed’s from Switzerland. Looking upslope towards the summit, July 25, 1987. Contrast the amount of snow with that from 1988. The view from the summit was astounding! While in 1987 the crater was filled with clouds, presenting only glimpses of the dome, 1988 was clear, with views north to Spirit Lake, and beyond to Mt. Rainier. The following year presented what was, at the time, a unique opportunity. Returning to Portland from a wedding in Spokane, I was told if I wanted to go on a field trip to Mt. St. Helens with Paul Hammond, along with USGS geologist Donald Swanson, I should show up at the meet up spot at Portland State at 4:30am the next morning. So, on September 24, 1989, I found myself on a hike into the closed areas north of the volcano, eventually climbing up into the crater, and on to the lower slopes of the dome. Along the way, we crossed the desolation of the pumice plain, examined the surfaces of pyroclastic flows, and explored newly incised canyons in the debris filling the northern breach of the crater. A new waterfall, Loowit Falls, with water flowing out of the upper reaches of the crater, and canyon wrens newly resident calling from the surrounding cliffs. Many years passed, as I found myself living far from the mountain. In June 2018, the opportunity presented itself to revisit Mt. St. Helens, venturing up the road to the visitor center on Coldwater Ridge. A hike to Harry’s Ridge brought back memories of thirty years before, when annual pilgrimages to the mountain were a regular occurrence. The changes in the mountain, and surrounding areas are tremendous. Life has regained a foothold, with green covering the slopes which once were a uniform gray and brown, devoid of plants. Trails now take people into areas once off limits, and it is no longer a novelty to find oneself in the midst of a volcanic landscape. Though it does give one pause, as most visitors see the volcano as inactive and benign. With the eye of geologist, with a different appreciation for time, this is just a brief interlude in the continuing process of volcanism. An interlude where life and erosion hold court. In time, a short time to a geologist, Mt. St. Helens, and the other quiet volcanoes of the Cascade Range, will erupt again. Destroying, and renewing the landscape, a testament to the dynamic planet we live on. In some ways, we owe our very existence to volcanoes, as they replenish the atmosphere with essential gases, an important step in the ongoing global recycling mechanism called plate tectonics. Some astrobiologists and planetary geologists even go so far to suggest the presence of plate tectonics is a limiting characteristic of planets for the presence of life. Something to reflect on the next time you hear of a destructive volcanic eruption. Perhaps better to think of it as a constructive event, ensuring the habitability of the Earth, the only home our species has. Those of us who work in science education and outreach, including the staff at the Astronomical Society of the Pacific, do so out of a sense of hope and belief our efforts make a difference in the lives of learners of all ages. At times that hope takes a hit when we hear about the wide range of discredited ideas and misconceptions people hold. With the amount of evidence available, one would think the contentions the moon landings are a hoax, the earth is flat, that a dark planet is set to collide with the earth, or a periodic alignment of planets is somehow rare and a portent of doom, would have disappeared for good. Over the past year or so, all of these have reappeared in a variety of news media, raising fears amongst those who are uncertain of who to trust, and consternation from educators and scientists who thought the last time they debunked these ideas was indeed, the last time. Much discussion has taken place about how to address ideas and misconceptions such as these, some of it in past posts of this blog. Experts and commentators acknowledge it is a difficult thing to change someone’s core beliefs, and the presentation of facts and evidence may only serve to further entrench the belief. It seems as though some sort of transformative experience is required for those who have held their ideas for a long period of time. For younger learners, ensuring they have access to an education which promotes collecting and reasoning about evidence, and the communication of evidence-based explanations of natural phenomena may serve to create a culture where ideas at odds with the evidence fail to find fertile minds in which to grow. So, why the focus on phenomena rather than a set of core topics? In short, because it helps make science education more relevant and equitable for students. For most of human history, people have attempted to explain the natural phenomena they found themselves immersed in. It was relevant to them to discover something about the nature of shadows, and how different materials affected a beam of light. It was relevant to utilize the patterns they observed in the day and night skies to navigate, or to know when they should plant crops, or hunt, or get ready for a time when resources were scarce. For many people in our modern society, these past explorations and explanations are irrelevant, and perhaps even contrary to what they believe. The suggestion is if they can make a personal observation to share with everyone else it is more valid than those made in the past as a scientific explanation of the universe was under development. In other words, it is their personal experience of a particular phenomenon that is paramount and trustworthy. “The most powerful phenomena from an educational perspective are culturally or personally relevant or consequential to students.” and “A good phenomenon builds on everyday or family experiences: who students are, what they do, where they come from.” (http://stemteachingtools.org/assets/landscapes/STT42_Using_Phenomena_in_NGSS.pdf) Students are more apt to engage productively with, and incorporate a scientific explanation for a phenomenon when they feel a sense of connection. A further implication for the centrality of phenomena in science instruction is it makes the science more accessible to learners, and more equitable, supporting the engagement of all. Creating science educational experiences for young learners centered on phenomena may provide the means for ending the recurring cycle of false ideas and misconceptions. When confronted with eternal recurrence, Zarathustra reacted with nausea. As science educators, we would like nothing more than to not cover old ground time and again. A version of this post first appeared as the Education Matters column in the Winter 2017 edition of Mercury Magazine, a publication of the Astronomical Society of the Pacific. For two years and more, the total solar eclipse of August 21, 2017 consumed my life. From writing and rewriting activities designed to teach about the eclipse, delivering numerous professional development sessions and workshops to teachers around the country, planning and hosting webinars, and caring for a growing cadre of volunteer photographers from coast to coast, it seemed like all eclipse, all the time. In early July, I was burned out, and could not wait for August 22 to dawn, with no eclipse to look forward to, or activities to facilitate. When I arrived at the Oregon Star Party, in the path of totality 45 miles east of Prineville, Oregon, all I wanted to do was hang out in the quiet. The smell of junipers, and the sight of mountain bluebirds on the drive into the Ochoco Mountains helped improve my mood, perhaps because they had nothing to do with the eclipse, and they were a reminder of the beauty of the high desert. The night sky in the Ochoco Mountains is usually pristine, where on a good night the Milky Way will stretch from horizon to horizon, and up to a dozen deep sky Messier objects are visible to the naked eye. For me it is usually enough to sit back and gaze into the depths of time and space, the telescope left unused. During a stint volunteering in the information tent, a woman came in and exclaimed “I know you, you’re the Megamovie guy, you’re famous!” And so I met Catherine Roberts. The Eclipse Megamovie is a project where the Astronomical Society of the Pacific partnered with the UC Berkeley Space Science Lab, and Google to produce a movie of the total eclipse from coast to coast. Using volunteer photographers with a variety of skill levels and equipment, the ASP’s role was to recruit, care for, and train what became a cadre of over 1,400 volunteers. Catherine was one of these volunteers. Later that afternoon, we discussed the settings to use on her cameras, and thus on my own. It was a simple thing, however meeting Catherine, and her enthusiasm, did wonders for my own excitement level, as once again I started looking forward to the eclipse. An evening of dense smoke, and another with clouds obscuring the sky, had everyone concerned the eclipse would prove elusive to our observations. Monday, August 21 dawned with a thin haze of smoke and a few clouds along the horizon. Everyone arose and set up their equipment in the hope of seeing the phenomenon we had all traveled so far to see, putting up with washboard gravel roads, and a dusty landscape reminiscent of Mars, the topic of my Saturday evening talk to the gathered astronomers. At first contact, whoops and shouts of joy rose into the sky, greeting the beginning of the eclipse. As the partial eclipse deepened, anticipation rose, until finally, with a flash of the diamond ring, the solar corona sprang into our awareness. Words are insufficient to describe what we saw with our unshielded eyes. After an all too short 83 seconds, another instance of the diamond ring, and totality was at an end. With an hour of waning partial eclipse ahead of us, my neighbor Rob brought me a can of Chromosphere Ale from Ecliptic Brewery to celebrate. It was a marvelous experience to share standing in the shadow of the Moon with so many like-minded people on a barren ridge high in the Ochoco Mountains. A phenomenon like a solar eclipse is, as someone once said, the most democratic of experiences, where everyone shares in a collective experience of awe at the stunning beauty of what looks like a hole in the sky. It is no wonder the ancients worshiped the Sun, inventing all manner of myths and deities to explain an eclipse when their mind has lost its ability to do so rationally. And the Eclipse Megamovie? Tens of thousands images from the majority of the volunteers, including Catherine Roberts and the author, is producing something marvelous. Its story is compelling in its own right. The total solar eclipse taking place on August 21, 2017 is a natural phenomenon on a grand scale. Though only those on the narrow swath cutting across the country from Oregon to South Carolina will see totality, everyone throughout the entire rest of the North American continent will have the potential to see a partial eclipse. One of the more remarkable aspects of this eclipse is it is taking place during normal school hours, on a day when many, if not most schools across the country are in session. For many it is the first day of school for the year. This creates for educators a teachable moment without compare, providing an opportunity to engage learners in investigating, and explaining using evidence-based reasoning this spectacular phenomenon in the sky. So, what to do when the excitement fades and there isn’t an easily accessible phenomenon for students to experience directly? How do educators keep the momentum going? For most of the sciences, it is relatively easy to demonstrate phenomena in the classroom, or to point to something learners experience in their daily lives, thus actively engaging them in a scientific investigation. Other than an eclipse, what astronomical phenomena are learners able to experience first hand or can relate to in their own lives? The phases of the moon, and the seasons are perhaps the easiest to experience and investigate, and maybe tracking the brighter planets as they change position from night to night. Noticing that not all stars are the same color, or the same brightness is a good one, though the patterns they make in constellations and asterisms are less valuable since those patterns are not inherent to any scientific processes learners can investigate. The truth of the matter is, most astronomical phenomena are not accessible to learners, or useful for engaging them in an active, inquiry-based classroom investigation. It isn’t that the phenomena are lacking interest for the learners, they just don’t rise to the level of a teacher posing a problem such as: “It rained last night and you noticed there were puddles of water on the playground when you got to school. When you left at the end of the day, the puddles were gone. Where did the water go?” This lack of relationship to a teacher or learner’s normal, everyday life may help explain why astronomy and space science are traditionally underrepresented in curricula and classroom instruction. In the presence of a robust program of space exploration, particularly if humans are involved, space science instruction is able to utilize various missions as an engagement into an investigation. This works well if the phenomena under investigation bears some similarity to our experience on Earth, or has to do with the potential for life elsewhere. For example, Mars exploration is a popular subject leading to a variety of classroom experiences, possibly due to the similarity of Mars to Earth, the long history of speculation about life on Mars, and the potential for an eventual human on what is arguably the most fascinating object in the solar system beyond Earth. This use of what we might call analogous phenomena is worthwhile in that they create an indirect experience and relevance for learners. Moving to phenomena beyond the solar system presents a unique difficulty to the science educator due to their remote nature and lack of easily identifiable analogous phenomena. For example, one of the performance expectations for middle school learners in the Next Generation Science Standards (NGSS) says “Students who demonstrate understanding can: Develop and use a model to describe the role of gravity in the motions within galaxies and the solar system.” Investigating gravity within the classroom is easily accomplished, however it can prove problematic when extended beyond to the solar system, and further to galaxies. It requires greater abstractions than many learners are able to handle. They are not able to directly observe and experience the motions, and have to infer them based on changes in position of the planets. On human time scales, motion within galaxies is less available, requiring more direct instruction from educator to learner, thus taking the investigation away from the learner-directed or educator-guided inquiry called for in the three-dimensional learning environment of an NGSS classroom. This is an important challenge to astronomy and space science educators, to develop a rationale and identify a suite of astronomical phenomena educators can incorporate into their instruction. Imagery of distant galaxies and nebulae are stunning in their ability to show us what the universe looks like. Identifying the phenomena they display and we want learners to investigate is much more difficult. This year’s solar eclipse is perhaps setting the stage for a resurgence in space science in the classroom. It is our task to make sure the learners have something to pique their interest, a suitable provocación to engage them in the wonders of the universe. This post originally appeared as the Education Matters column in the Summer 2017 issue of Mercury magazine, a publication of the Astronomical Society of the Pacific.